FORT LAUDERDALE, Florida – Cardinal Daniel DiNardo, president of the U.S. Conference of Catholic Bishops (USCCB) announced on Wednesday that the conference will explore the possibility of sending a bishops’ delegation to the U.S.-Mexico border to inspect detention facilities and to offer a physical sign of solidarity with migrants and refugees. 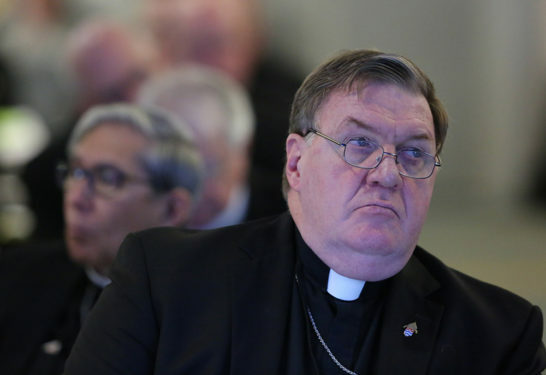 The decision to pursue such an effort comes in response to a suggestion by Cardinal Joseph Tobin of Newark, N.J., during the first session of the spring meeting of the USCCB. The bishops began their bi-annual meeting with Cardinal DiNardo, who’s also the Archbishop of Galveston-Houston, issuing a statement condemning the Trump administration’s recent announcement not to allow women fleeing domestic violence to seek asylum in the United States, as well as the policy of separating families at the border. 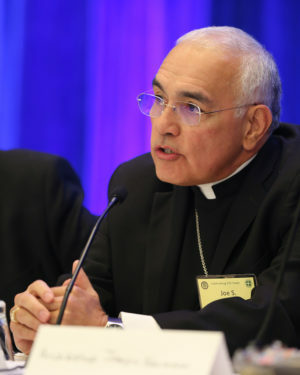 Following the morning session of the meeting, Cardinal DiNardo said that Bishop Joe Vasquez, head of the USCCB Committee on Migration, and Archbishop José Gomez, head of the working group on migration, would be responsible for exploring the possibility of the border delegation, and in response, received a round of applause from the bishops gathered in Florida. The urgent need for action on immigration dominated discussion during the first day of the meeting. Bishop Nicholas DiMarzio of Brooklyn criticized the “restrictionism, somewhat based on racism” of the two immigration proposals that are currently under consideration in Congress. “It’s hard for people to decide what they think about it. But in fact that is what we are seeing. This is a crisis situation,” he said. Yet perhaps the boldest moment of the discussion came when Bishop Edward J. Weisenburger of Tucson, Ariz., suggested that the bishops discuss the possibility of “canonical penalties” for Catholics who cooperate with unjust immigration policies and prevent immigration reform. Bishop Weisenburger said such penalties are in place on issues such as abortion and that immigration is also a life issue. He went on to note that canonical penalties are issued “to heal” and “therefore, for the salvation of these people’s souls, maybe it’s time for us to look” at them. The USCCB will continue their bi-annual meeting in Fort Lauderdale through Thursday, June 14. I am horrified at what we have witnessed at the border and urge the bishops to make this trip to give witness of the Catholic faith in action.